The RMU Colonials add "Worky" to their helmets. NEVILLE TWP., Pa. — Robert Morris and Mercyhurst met for their final home-and-home series of the season with a Friday match up at the RMU Island Sports Center. The night started with an emotional tribute to Mark Workman after the starting lineups. The RMU players honored the late coach by adding “Worky” to the back of their helmets. The Lakers would take a 2-0 lead in the first with goals from Bryan Sienerth and Derek Barach. Before the end of the second Mike Louria would cut the Lakers lead 2-1. Neither team could find another opportunity, Lakers take the 2-1 victory. Afterward, meeting at center ice, Brandon Wildung, Brendan Riley, and other members of the Mercyhurst team invited Robert Morris to join them for their post game prayer. The Colonials will travel up I-79 to battle the Lakers on their home turf. The puck will drop at 7:05 p.m. at the Mercyhurst Ice Center. Brendan Riley warms up with the Lakers. Kane Elliott warms up with the Lakers before the game. Fans emotional night at the island with young hockey fans packing the stands. 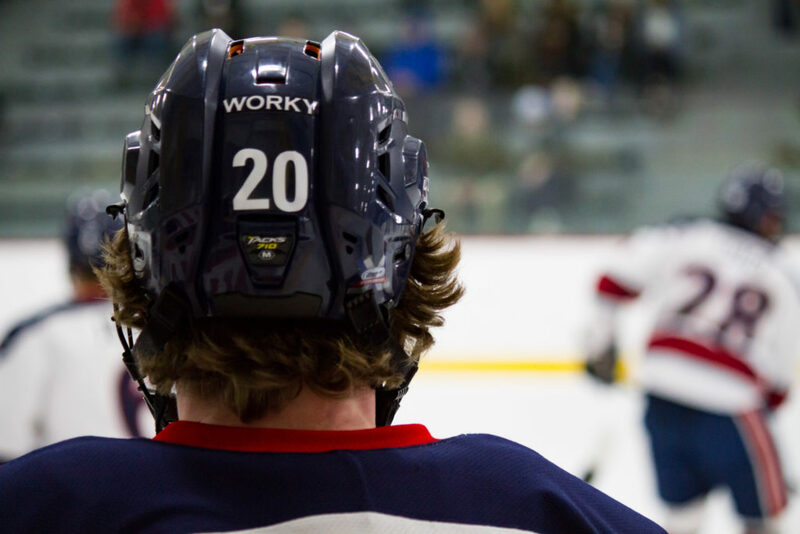 The RMU Colonials add “Worky” to their helmets. Both teams pay respect to the late Mark Workman. Timmy Moore and players pay their respects during the pre-game tribute. Bryan Sienerth celebrates after scoring the first goal of the game. Kane Elliott falls to the ice after hitting Elias Ghantous. Derek Barach celebrates after netting the second of the game. Spencer Dorowicz flies into the boards after getting hit from behind by Jack Riley. Brandon Wildung scrambles to block the puck during the second. Nathan Ferriero and Patrick Piacentini fight for the puck along the board. Mike Louria celebrates after scoring in the second. Les Lancaster falls over Francis Marotte in the third. Eric Israel disputes a call, but heads to the box anyway. Francis Marotte ready to make a save. Elias Ghantous blocks a shot with his arms after losing his stick.